As he did in his classic Synchronicity, Joseph Jaworski once again takes us on a mind-expanding journey, this time to the very heart of creativity and deep knowing. Institutions of all sorts are facing profound change today, with complexity increasing at a speed and intensity we've never experienced before. Jaworski came to realize that traditional analytical leadership approaches are inadequate for dealing creatively with this complexity. To effectively face these challenges, leaders need to access the Source from which truly profound innovation flows. Many people, including Jaworski himself, have experienced a connection with this Source, often when called upon to respond in times of crisis--moments of extreme spontaneity and intuitive insight. Actions simply flow through them, seemingly without any sort of conscious intervention. But these experiences are chance occurrences--ordinarily, we don't know how to access the Source, and we even have a blind spot as to its very existence. In an extraordinarily wide-ranging intellectual odyssey, Jaworski relates his fascinating experiences with quantum physicists, cognitive scientists, indigenous leaders, and spiritual thinkers, all focused on getting to the heart of the Source. Ultimately, he develops four guiding principles that encompass the nature of the Source and what we need to do to stay in dynamic dialogue with it. Using the combination of narrative and reflection that made Synchronicity so compelling, Jaworski has written a book that illuminates the essential nature not only of visionary leadership but also of relationships, consciousness, and ultimately reality itself. "Source is one of the most compelling and original books on leadership I have read. Not only does it deepen our understanding of leadership, it brings us closer to a fuller understanding of our authentic self, the source of effective leadership." "A gem. Jaworski takes us on a personal journey to the source of creation. Profound and inspiring." 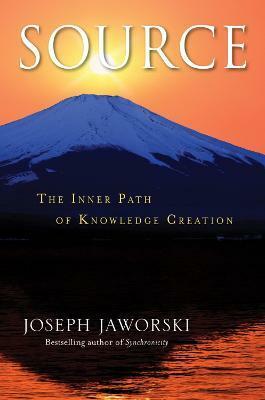 "Source is an impressive account of Jaworski's lifelong quest into the underlying realities of life. It provides in a convincing way and at the right time the kind of insights we need to shape our future. This book is a must-read for everyone who aspires to a leading role in creating the next stage of human civilization." "Leadership requires you to adapt thoughts to the facts and to inspire others with those thoughts. But which 'facts' do you see and how do thoughts become new 'ahas'? Source helps you to understand this process, bringing what you 'feel somewhere or vaguely' to a new level. So it's sustainable energy for your brain!" "Jaworski has spent his life exploring the path we all must walk if there is to be a livable future ahead. Source is a well-written story of the extraordinary people he has met and the fascinating discoveries he has made along the way. It can be read with pleasure and profit by anyone, and deserves to be." "Robert Greenleaf called foresight the 'central ethic of leadership, ' adding that 'to see the unforeseeable' and 'to know the unknowable' is the mark of a leader. If you want to know how to develop the capacity for better foresight, read Jaworski's book Source. It should be required reading for policymakers and those leading enterprises of every size." Joseph Jaworski is a founder and the chairman of both Generon International and the Global Leadership Initiative and is the founder of the American Leadership Forum. He is the author of the international bestseller Synchronicity and a coauthor of Presence.